In the animal kingdom colorful traits can be both a blessing and a curse. A new study from a group of researchers at Uppsala University has studied the conspicuous wing coloration of two species of damselflies. Their results imply that males, but not females, pay a high cost when using color to communicate with other damselflies, both in terms of predation risk and visibility to prey. Many animals, such as parrots, tropical fish or butterflies, are very colorful. Such colorful displays are favoured in sexual selection as they make the animal stand out, and color may therefore enhance mating success. However, color can also be costly, as it makes the animal more conspicuous to both predators and prey. colorful traits are therefore subject to opposing selection pressures: positive sexual selection by conspecifics (increased mating success) and negative natural selection by predators (higher predation risk) and prey (lowered hunting success). 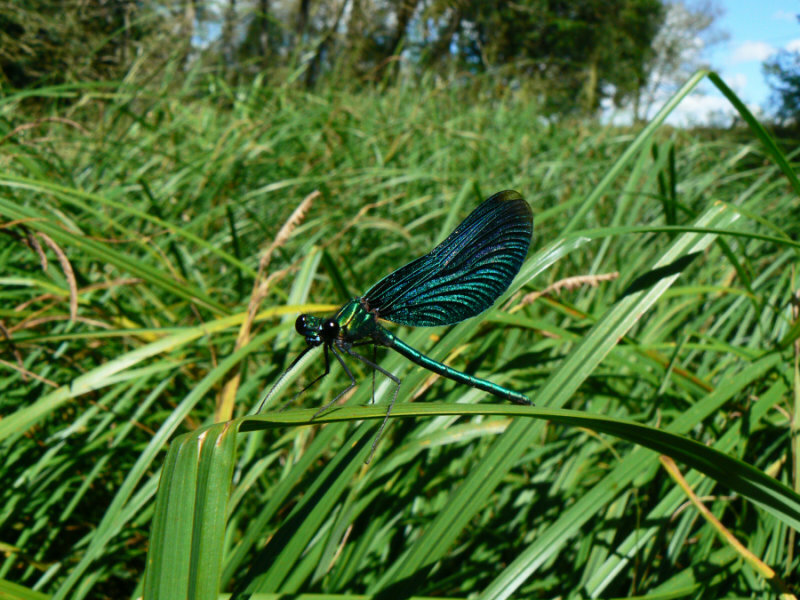 In the new paper the researchers studied the conspicuous wing coloration of two species of damselflies, which are predated by birds and prey on small flies. The conspicuous wing coloration is used in color communication between the sexes and between different species of damselflies. Using electrophysiology, they first determined the color vision of the damselflies and found that they see well in UV as well as in the human visible range. Second, the researchers measured the wing coloration using spectrophotometry and confirmed that males are more colorful than females. Third, they estimated the predation risk in natural populations by quantifying the predated wings from bird feeding stations, and found that more males than females were consumed. The researchers finally used the data together with previously known color vision of the bird predator, and the fruit fly prey, to model how visible the wing coloration is in natural environments. The researchers found that males are very conspicuous to bird predators, to other damselflies, and to prey, while females remain predominantly cryptic (i.e. hard to see against the background). This implies that males, but not females, pay a high cost when they use color to communicate with other damselflies, both in terms of predation risk and visibility to prey. ‘One of our most surprising findings was that male damselflies are unable to discriminate the wing coloration of perching females. We hypothesize that females use this to reduce male harassment, which is very intense in damselflies. Our study demonstrates that by including several levels of interactions in predator-prey systems, we get a more complete understanding of the costs and benefits of being colorful,’ says David Outomuro, post doc at the Department of Ecology and Genetics, Uppsala University, and corresponding author of the study.